A few days ago, Paul and I visited a couple, two of our very best friends, at a hospital and their new born baby boy aged 2 days. Nowadays hospitals in Hong Kong encourage family members, friends and relations to express their love through touching and handling a new born. Good for his psychology as well as for the development of his immune system, I believe. Babies always win our hearts! We can immediately be touched by people and things imbued with meaning derived from a common language or signifying system. In arts, it is called representational form, representing something we are familiar with, like a human portrait or a piece of familiar landscape. And the linkage is immediate. I was almost moved to tears by the baby that day at the ward by his mother's bed side. Non-representational abstract art forms, on the other hand, are not so immediate. Here, the artist employs his special method of communication. Without knowing or appreciating his communication method, a viewer can't easily understand his art, not to mention being moved by it. 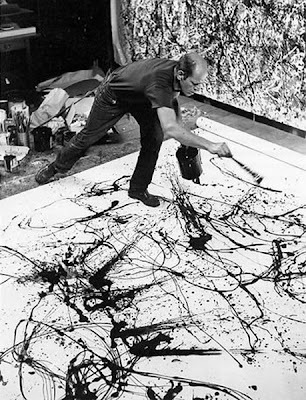 Jackson Pollock, the greatest American abstract painter is an example. His paintings were non-representational, and his method was splashing colors onto his canvas, a pioneer in abstract painting. Pollock was special, even without understanding his communication method, a discerning art lover oftentimes can identify his special paintings out of many abstract ones, and with the viewer's inner passion being stirred up by them! Pollock loved to use big canvas. He drew with dedication and passion. To understand his art, one needs to recreate how he did his work, how his splashed his canvas with his brushes and buckets of paints, how he viewed his canvas as his inner self, as he impulsively filled every corner of it with variations of his distinctive and distinguishing color patterns, signifying his inner emotion, which may or may not be triggered by some representational objects, and his urgency in expressing it, which he probably found impossible to represent in any representational form. It's like Chinese calligraphy, especially the running style (草書), where the literal meaning can't be easily deciphered (or can't be deciphered at all). Sometimes I would wonder, if a viewer can easily grasp the linguistic meaning of a great piece of running style calligraphy, would he be as much focused on the emotions thereby expressed or on appreciating the art-form itself? And isn't it the same with Pollock? The greatness of his abstract painting is precisely due to its being abstract!